Socialization and exercise are essential to your dog’s overall health and well-being. We offer supervised off-leash dog play, which allows your dog to unleash pent up energy, leaving them happy and tired by pick up time. Our attentive and caring staff supervises all activities, which are designed to develop and reinforce social skills and manners. Your dog will be selected to play in a size specific playgroup. Dogs play, run and jump on impact friendly K9Grass™ which is easy on your dog’s joints and paws. Our dog boarding facility on Long Island was specifically designed for your dog and is the ultimate happy, fun and safe indoor dog park. To ensure your dog a place in daycare, we strongly encourage weekly reservations. 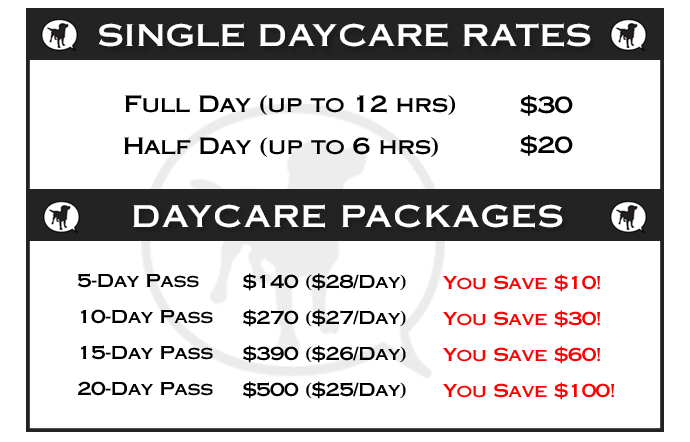 For the safety of our clients, daycare space is limited. All social hounds will be picked up by 6:30 pm. A late charge of $10 will be incurred after 7:00 pm. Any dogs not picked up by 7:00 pm, with no call will be checked into our hotel for a night at parents’ expense.